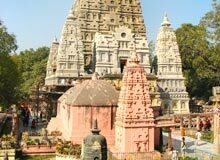 Mahabodhi Temple is one of the ancient and most important shrines of India. Located at Bodhgaya, Mahabodhi Mahavihara Temple is easily accessible from the major towns and cities of Bihar. The nearest airport is located at Patna that lies at a distance of 96 kms from Gaya. The holy town Bodh Gaya or Gaya has its own railway station. The town is also connected with major cities by network of roads. The literal version of Mahabodhi Temple is the Great Awakening Temple.